Swanage’s pride and joy is its gently shelving, golden sandy beach, and clear unpolluted water. The Town Council is proud to say that in 2018, and for the 17th consecutive year, the beach was once again awarded the Blue Flag and Seaside Award. This accolade is given to beaches that have been inspected for quality of water, beach cleanliness, and access facilities. The sea off of Swanage Central Beach consistently meets the highest European standards and is monitored by the Environment Agency between 15th May and 30th September each year. Blue Flag beaches must comply with a number of criteria covering environmental education and information, water quality, environmental management, safety and services. 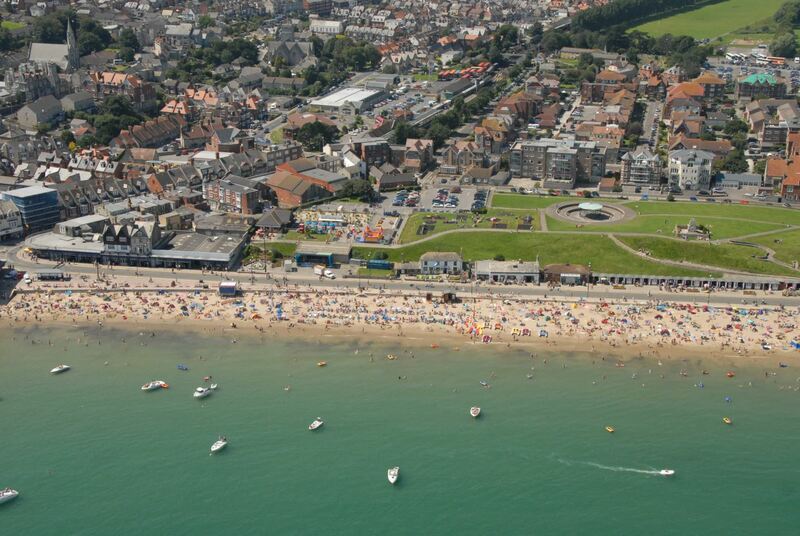 The Seaside Award recognises and rewards beaches that achieve the highest standards of beach management and, in the case of bathing beaches such as Swanage, meet guideline water quality. Please click on the following links for further information on water quality and the Environment Agency profile of the bathing water. In the summer months the beach is patrolled daily by the Town Council’s Enforcement Officers, ensuring that beach regulations/byelaws are adhered to. There is a clearly marked craft free area, and Swanage Central Beach will once again have RNLI Lifeguard Services in operation for the summer season, commencing 26th May 2018, until 9th September 2018. Please follow the links for further information regarding the Blue Flag criteria and Seaside Award criteria. Dogs are welcome on Swanage beach between 1st October - 30th April each year. From the 1st May - 30th September, dogs are not permitted on the Council-owned Central Beach, however, pet owners are welcome to use 'Monkey Beach' which is located by the old stone quay, close to the pier. Please note however, North Beach (the beach to the North of the Ulwell Stream) is privately owned above the mean high water mark and the beach owners have their own dog regulations in place. Please be aware of the owners' signs along North Beach to ensure you comply with these additional regulations. Thank you for your assistance. Dorset Dogs - for further advice, and information about dog friendly attractions, eateries and accommodation in Dorset, please visit the Dorset Dogs website. Dorset Dogs champion positive management for dogs in town, coast and countryside, and promotes responsible dog ownership. Please follow 'The Doggy Do Code' thank you. All boat and jet-ski users are asked to respect the bay’s regulations, with a 5 knot buoy area in operation between 15th March – 30th September each year. Vessels can be safely launched from the Town Council’s boat park at Peveril Point, which is located off Broad Road car park. Alternatively, dinghies and small, unpowered, craft can be launched from the Parish slipway, and also Monkey Beach (near the Stone Quay), although Monkey Beach can get very busy during high season. The launching of jet-skis and any powered craft at these locations is prohibited. The Slipway is located off The Square (near Swanage Museum & Heritage Centre), and all trailers must be removed from the slipway after launching. Ocean Bay Watersports is located at the northern end of the Town Council beach. They also have a slipway in operation. You can view a map giving the location of launch sites in the town. Sailing is another popular pastime, and the local sailing club can be found on Buck Shore, located next to the pier. Further information can be found on the Swanage Sailing Club website . In the summer months Swanage Pier comes alive with divers from far and wide, keen to experience the clear waters of the Pier and beyond. Charter diving boats operate from here. Please click on the following link for more information on diving in and around Swanage Bay.